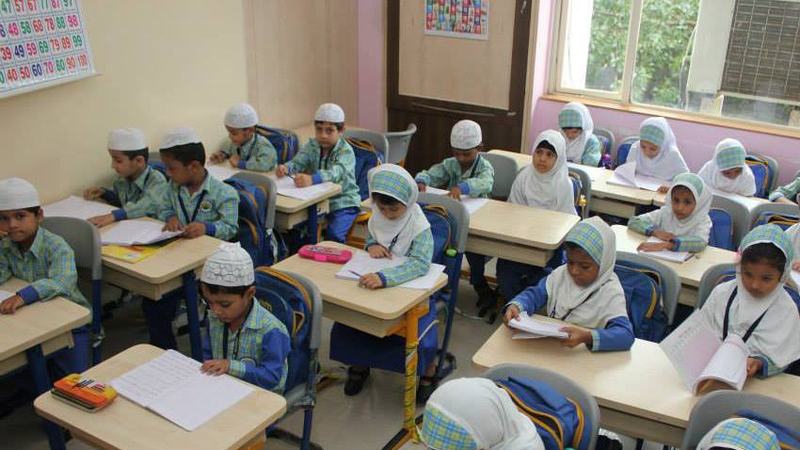 Al Salam is an English medium Islamic school which aims to impart secular education in an Islamic environment. Islamic principles and teachings are integral parts of school curriculum. As an Al Salam student, the child first learns to love his creator Allah Subhan wa Ta’ala before he learns math, science or social studies. Reading of Holy Quran, Hadith, Duas are lessons that are conducted on a daily basis. Emphasis on co curricular activities such as P.T, Karate, and educational excursions, ensures all round development of the child. Well qualified teachers and staff at Al Salam maintain a family like warm and embracing atmosphere and strives to acknowledge each child’s physical, mental and emotional potential without any discrimination or bias. Facilitating such a loving and encouraging atmosphere propels the student with leaps and bounds on his academic journey. Ever growing and evolving Al Salam English School strives to provide education to children that will inshAllah help them to attain the best in this world and the hereafter too. May Allah accept all our deeds and keep us rooted on sirat al mustaqeem. The vision of the school is depicted in the logo of the school. The palm tree in the logo represent a MUSLIM. As reported in Bhukari on the authority of Ibn Umar, Allah's Apostle said, "Amongst the trees, there is a tree, the leaves of which do not fall and is like a Muslim. Tell me the name of that tree." Everybody started thinking about the trees of the desert areas. And I thought of the date-palm tree but felt shy to answer the others then asked, "What is that tree, O Allah's Apostle ?" He replied, "It is the date-palm tree." A strong tree whose roots (of tauheed) are deep in the ground and whose leaves spread upward delighting the farmer and the onlooker. The book represents the true knowledge The Holy Quran. Alhamdulillah the school is founded with a vision to prepare the next generation as strong believers with rightly grounded knowledge, as leaders and da’ee of our ummah who will spread the word of Allah in a proper peaceful way, inshaAllah.